This is a guest Asian-inspired steak recipe from blogger Cynthia Chen McTernan, who shares more than 80 modern recipes combining her Chinese roots, Southern upbringing, and Korean mother-in-law’s table in her new book, A Common Table. All it takes is the smell of sesame oil for my husband to come wandering into the kitchen. When something can rouse an appetite so powerfully all on its own, it needs very little else to become a good meal, and gireumjang, a sandy- textured dipping sauce made from nothing more than sesame oil, salt, and black pepper, is proof positive of this. Nutty and toasty, punched up from the salt and warm from the black pepper, gireumjang is typically served with thin slices of barbecued pork belly — or samgyeopsal — but my mother-in-law also favors serving it with strips of sirloin steak. The latter, smoky from a quick sear in a good cast-iron pan, is my favorite. 1. Season the steak generously with salt and pepper on both sides. If the steak is cold, let it rest until it comes close to room temperature, 30 minutes to 1 hour. 2. In a 10- or 12-inch cast-iron pan or other thick-bottomed skillet, heat a slick of vegetable oil over high until shimmering and very hot. Add the steak and let sizzle energetically for 2 to 3 minutes, until a nice brown crust forms on the bottom side. 3. Flip and cook for an additional 1 to 3 minutes, until the steak reaches your desired doneness. 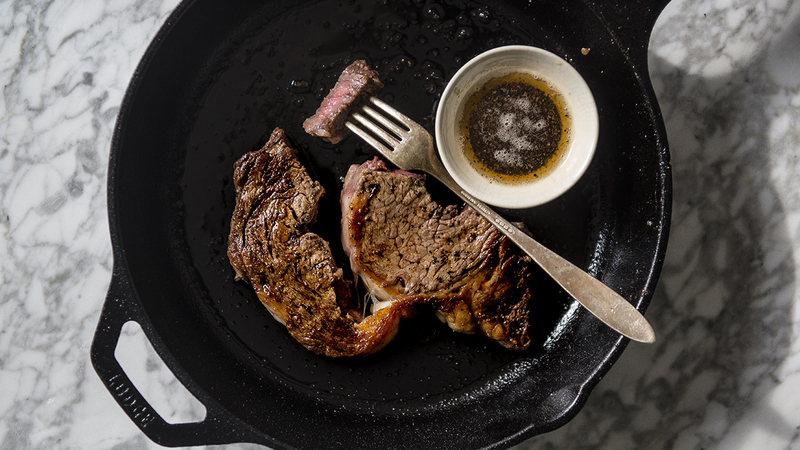 An instant-read thermometer is tremendously useful for checking doneness — medium-rare will read between 130°F to 140°F, medium will read 140°F to 150°F, and medium-well 150°F to 155°F. 4. Remove the steak from the heat and let rest for 5 to 10 minutes to let the juices distribute. Meanwhile, make the gireumjang sauce. 6. Slice the steak and serve with gireumjang drizzled over top or on the side as a dipping sauce. Enjoy! Reprinted from A COMMON TABLE: 80 Recipes and Stories From My Shared Cultures. Copyright © 2018 by Cynthia Chen McTernan. Published by Rodale Books, an imprint of Penguin Random House.